Pluribus Networks announced a major update to its network monitoring and business analytics solution. Pluribus VCF Insight Analytics (VCF-IA) now provides automated metadata tagging allowing the business to get a contextualized view of their data center consumption. In addition, VCF-Insight Analytics is now available as a premier monitoring solution from Dell as part of its software-defined open networking portfolio. Pluribus said VCF-IA 1.5 can be deployed in any data center network – either with or without other Pluribus Networks switches – to enable advanced monitoring and business analytics across a wide range of networking topologies. “For years, enterprises have been searching for an affordable way to gain deep insight into the business operation of their data center IT systems from the network perspective, but their efforts have been severely constrained by the significant investment required,” said Mark Harris, VP of Corporate Marketing at Pluribus Networks. “Working with Dell, we have proven that customers can deploy our switching solutions to transform their data centers and realize the industry’s most cost-effective SDN. Sunway Digital Wave (SDW), a managed service provider in Malaysia, is using Saisei FlowCommand to guarantee fair and equal access to network services and a superior quality of experience (QoE) to all subscribers. Saisei, which is a start-up based in Sunnyvale, California, offers a real-time flow-policy control, analytics and security platform that leverages patented flow-engine technology to change the way that TCP/IP network traffic under its control behaves. Saisei re-engineers how flow control, security and visibility can be realized when using “domesticated” TCP/IP flows. Its FlowCommand runs on x86 processors atop commodity hardware, either as a bump-in-the-wire on a server in the data-forwarding path or as a VM under hypervisor control. The software can monitor up to 5 million concurrent data flows on a 10G link 20 times per second. While examining the flows it can apply any combination of up to 40 bandwidth, business and security policies to each flow and execute those policies in under one second. Saisei saids its flow-control technology guarantees each user or host has equal access to the network regardless of how many users are on the network or what applications they are running. In this deployment,Sunway Digital Wave is using Saisei's technology to make links higher performing, more secure, scalable, ordered and more predictable than any traditional packet-based routed IP network. 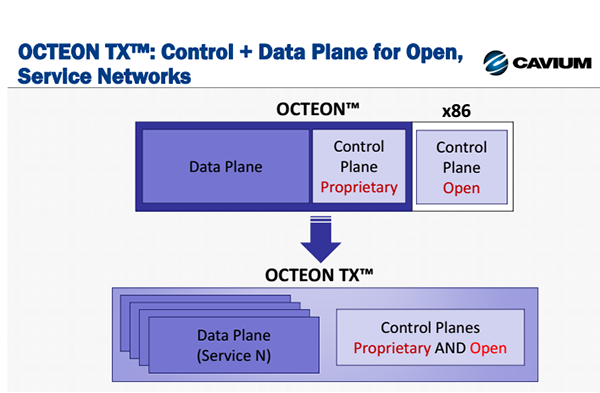 “One of the big challenges we faced was the first and largest users accessing our network consumed most of the bandwidth, compromising performance for other users and high-priority applications. We started to get complaints about network performance from customers frustrated by slow applications and Internet access,” said Daniel Soh, Assistant General Manager, Sunway Digital Wave. “Customers get what they pay for and we can deliver the bandwidth needed for a high-quality, reliable user experience. Customers are much happier with the network performance, we get fair fewer complaints these days,” said Soh. 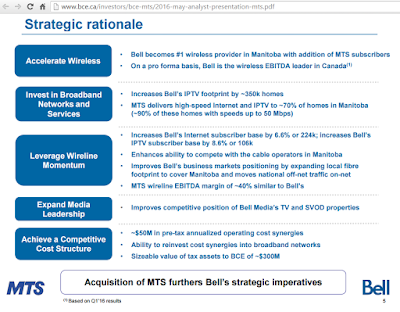 Bell Canada Enterprises agree to acquire all of the shares of Manitoba Telecom Services (MTS) for approximately C$3.9 billion (US$3.1 billion). 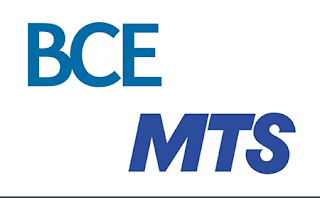 BCE, which is based in Montreal, said the deal brings a 22% premium for MTS shareholders and long-term benefits to MTS customers and the Province of Manitoba. "This transaction recognizes the intrinsic value of MTS and will deliver immediate and meaningful value to MTS shareholders, while offering strong benefits to MTS customers and employees, and to the Province of Manitoba," said Jay Forbes, President & CEO, MTS. "We are proud of our history and what we have achieved as an independent company. We believe the proposed transaction we are announcing today with BCE will allow MTS to build on our successful past and achieve even more in the future." Provide access to Fibe TV, North America's most innovative TV platform. Make Winnipeg its headquarters for Western Canada, which with the addition of the MTS team will have a total of approximately 6,900 employees. In addition, TELUS reached an agreement in principle with BCE that will see approximately one-third of MTS’ postpaid wireless customers become TELUS customers once the purchase of MTS by BCE concludes. 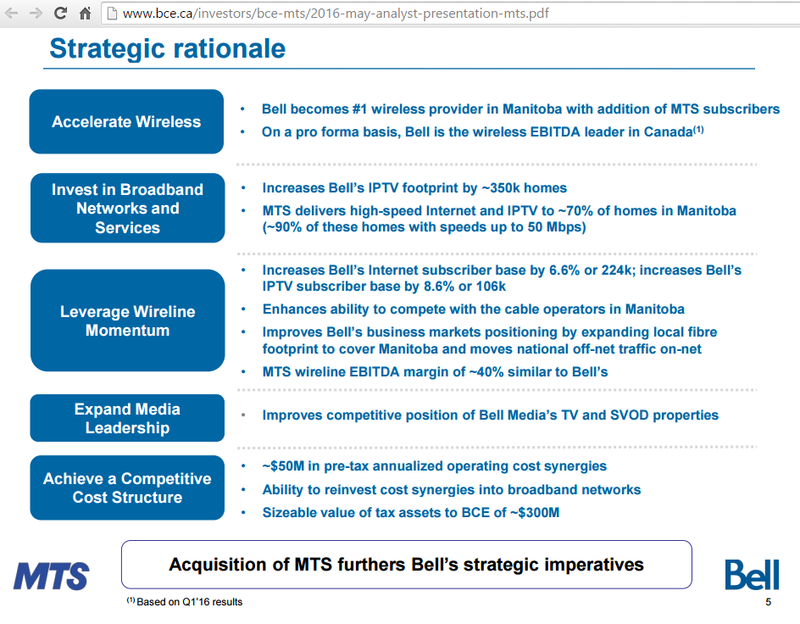 As part of the agreement, Bell will also assign one-third of MTS’ dealer locations in Manitoba to TELUS. Ruckus Wireless reported Q1 revenues $100.6 million, an increase of 22.5% from the first quarter of 2015. Non-GAAP net income was $12.2 million for the first quarter of 2016, compared with non-GAAP net income of $6.5 million for the first quarter of 2015. Non-GAAP operating income was $12.4 million for the first quarter of 2016, compared with non-GAAP operating income of $6.8 million for the first quarter of 2015. GAAP net loss was $0.9 million for the first quarter of 2016, compared with GAAP net loss of $0.6 million for the first quarter of 2015. "Our first quarter results were strong, with revenue at the high end of our updated guidance. Combining the revenue strength with a continual focus on operational execution, non-GAAP operating margin and non-GAAP earnings exceeded our previously updated guidance," said Selina Lo, president and chief executive officer, Ruckus Wireless. 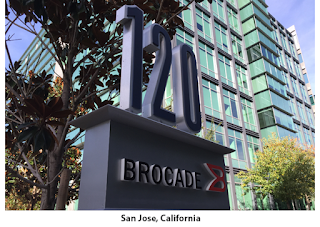 "I remain excited about our pending acquisition by Brocade, which will enable us to jointly deliver innovative, value-added solutions to our enterprise and service provider customers." 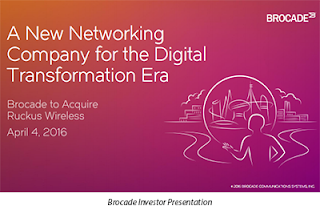 Brocade agreed to acquire Ruckus Wireless in a deal valued at approximately $1.5 billion, consisting of $6.45 in cash and 0.75 shares of Brocade common stock for each share of Ruckus common stock. 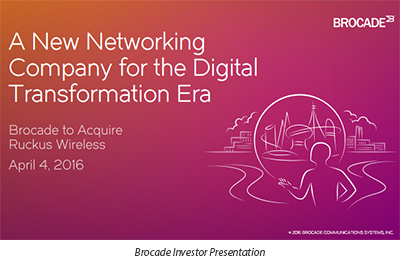 Ruckus' wireless products add to Brocade's enterprise portfolio and will also significantly strengthen Brocade's strategic presence in the broader service provider space. Ruckus has over $370 million in annual revenue and over 1,000 employees worldwide. Ruckus Wireless' current CEO, Selina Lo, will continue to lead this division, reporting to Brocade CEO, Lloyd Carney. Ruckus is based in Sunnyvale, California, not far from the Brocade headquarters. "This strategic combination will position us to expand our addressable market and technology leadership with Ruckus' fast-growing wireless LAN products, and supports our vision to deliver market-leading New IP solutions that enable the network to become a platform for innovation," said Lloyd Carney. Brocade now expects revenue for its fiscal quarter ending 30-April-2016 to be in the range of $518 million to $528 million, compared with the range of $542 million to $562 million in its previous guidance. Non-GAAP diluted earnings per share for the second fiscal quarter is expected to be within the range of $0.21 to $0.23, compared with the range of $0.22 to $0.24 expected previously. "Consistent with the general softness in IT spending reported by many of our partners and peers, we expect revenue for the quarter to fall short of our original expectations," said Lloyd Carney, CEO of Brocade. "This is largely the result of weaker than anticipated SAN revenue. In addition, IP Networking headwinds, noted on our fiscal Q1 2016 earnings call in February, continue to negatively impact our sales, particularly in our service provider and U.S. federal business. We are addressing these near-term challenges by continuing our focus on sales execution in this weaker demand environment, maintaining prudent expense controls and managing our investments in line with our stated priorities. We continue to execute on our strategy to build a pure-play networking company for the digital transformation era that expands our market reach, diversifies our revenue mix, and creates exciting, incremental opportunities for growth." New "Unity" family of all-flash storage -- aimed at small and medium-size IT deployments. It is available in all-flash, hybrid, converged and software-defined configurations and is designed to help customers make an affordable and simple transition from disk to flash. New Virtustream Storage Cloud -- a global cloud storage platform offering enterprise-levels of resiliency and performance combined with true web scale. New EMC MyService360 cloud-based service dashboard -- provides a visually compelling, near real-time visibility into the health and status of a customer's entire EMC data center environment. MyService360 is built using EMC's internal data lake and provides powerful analytics and visualization tools designed to improve, enhance and simplify the way customers engage with EMC products to make their jobs easier. 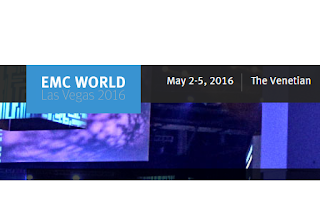 EMC Enterprise Copy Data Management (eCDM) -- an expansion of EMC's Copy Data Management portfolio which helps customers tackle data sprawl and reduce the cost of storing and managing multiple copies of the same data. eCDM enables customers to modernize their storage and protection strategy with discovery, automation and optimization of copy data to reduce costs and streamline operations. eCDM provides companies with a pan-enterprise solution to monitor, manage and analyze copy data, eliminating the waste organizations will spend storing data on the wrong tier of data or when they no longer need the data all together. ViPR Controller 3.0 -- bridges traditional and cloud native environments to enable business transformation, including support for over 50 EMC and third-party storage platforms. opportunity. Every business leader, across every industry, is facing the dilemma of how to support and grow traditional IT infrastructure while modernizing the data center in order to support the development of new applications and advance their digital agendas," said David Goulden, EMC Information Infrastructure CEO.